Real Madrid goalkeeper, Thibaut Courtois insisted that they don't talk about Cristiano Ronaldo in the dressing room despite their struggles this season. Cristiano Ronaldo joined Real Madrid from Manchester United in the summer of 2009 and scored 450 remarkable goals in 438 appearances for the Spanish giants before leaving the club to join Juventus ahead of the 2018-19 campaign. The Los Blancos failed to find a suitable replacement for their departing superstar and are struggling without him at the moment. They are currently third on the La Liga table, 10 points behind the leaders Barcelona. On the other hand, Ronaldo carried his impressive form at his new club as well and scored 15 goals in 21 Serie A games thus far. Thibaut Courtois says Real Madrid's players don't discuss Cristiano Ronaldo in the Santiago Bernabeu dressing room, despite them clearly missing his goals this season. "He is not being talked about in the locker room"
"It is mainly the press that drops his name. There were matches that we lost in which we got 10 chances but did not score. "At the same time he scores two for Juventus. Then it's easy to talk about him. 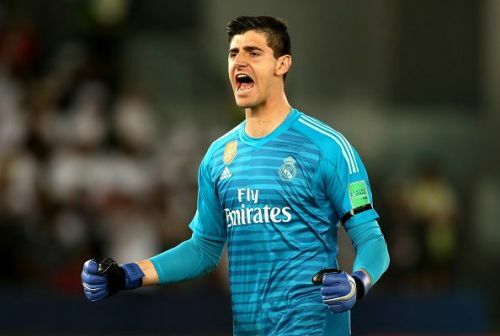 However, Courtois did admit that Real Madrid are missing the goals of their former talisman. "If Ronaldo leaves and there is no real top attacker in his place, you know that it will be a difficult year," he continued. "You take 50 goals away. "You hope that Benzema or Bale will score more and partly they do that too. We are making progress in the last few weeks. Real Madrid will play Alaves next in the league before making a trip to Camp Nou to play Barcelona for the first leg of the Copa del Rey semi-finals on February 7.